Soon to be opened at the Old Capers below Exit 133 and above the Chinese Tunnels. This place will help fill out the block and will bring a much needed addition to the food choices in downtown. The Monsoon room was probably the hippest place in Tacoma when it was a going concern with street cred matched only perhaps by Blackwater. The place to see and be seen and helped turned (some) Tacomans away from drinking mixed drinks with high fructose bulk mixers to ones with real ingredients. Also see the Volcano post on the Monsoon Room. No one knows the time or location of the future Monsoon Room. The Monsoon Room has opened a new mysterious facebook page. So there you are and here I am, its been quite a while dears.So very happy to see you now.Still, when, oh when will our smiles meet again? Become a Fan and be my friend...It's the only true way to know. by dolly varden on 10/19/2010 @ 8:27am 1022 South, at the old Monsoon Room location, is even better. But it will be good to have the Monsoon Room back wherever and whenever it returns. by L.S.Erhardt on 10/19/2010 @ 11:53am Never did go to the Monsoon room. By the time I became aware of it, they had shut their doors. 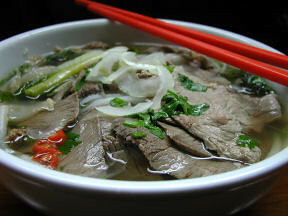 But as for the latest addition to the burgeoning Pho scene, sweet. Must check out. by Erik on 10/19/2010 @ 12:29pm The 701 space is really cool. Few historical buildings are as nice. by Erik on 10/19/2010 @ 1:30pm @Kevin: I miss the flash mob days at new restaurants like at Mary's. by Non Sequitur on 10/19/2010 @ 4:44pm What the hecks is a "Flash Mob"? A mob of flashers? I thought that went out of style in the 70s. We used to do it with Nixon masks. Are they using Obama masks these days? by Erik on 10/19/2010 @ 6:09pm What the heck is a "Flash Mob"? "At lunch the place was nuts! We filled the place up with friendly faces. Let me see if I can list everyone I know and/or met who was there. From our office: Brian, Ken, Dave, Mike, Anna, Joe, Michael, Sarah and I. Fellow bloggers ensie, Frinklin, jenyum, tacomachickadee, and Niki from GritCity. Likewise from the local media were Joseph and Mindy from the News Tribune, briefly Steve from the Weekly Volcano, and Todd from the Daily Index." 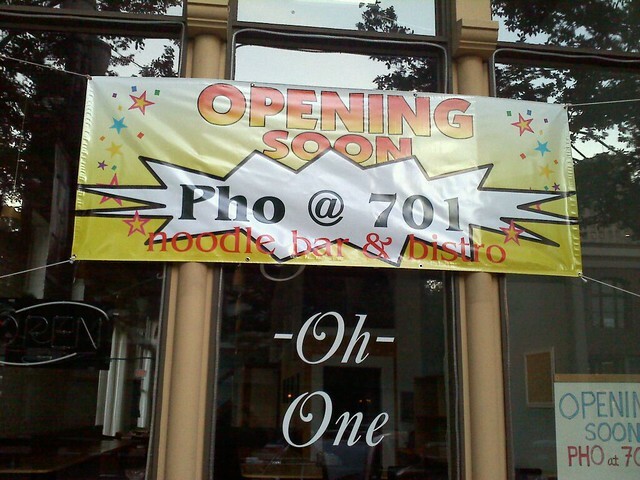 by jenyum on 10/19/2010 @ 9:05pm Downtown Pho! Yes Please! by jenyum on 10/19/2010 @ 9:09pm Must serve Pho Bo Kho.